ATOS and my new normal. So, once again, ATOS and I are going to spend an hour hanging out together. Although this time they’ve invited themselves round to mine. They’d better not be expecting a finger buffet. It’s strange, because obviously I have a lot of things to say about this. I have to go for another assessment after having been on PIP for just a year which really wasn’t expected, but they were a hell of a lot faster this time than last I’ll give them that. I’m going into this one having already had one assessment and so I know a bit more about how the process works, but I feel like I can’t talk about much of that at the moment. Because the internet has ears. And the paranoia of ill and disabled people is high. And I’m worried that my concerns about my assessment will be taken the wrong way. So instead, I thought I’d talk about something else. I got ill almost two years ago now. It seems like yesterday and a lifetime ago at the same time. When I look back at how I was before I got ill, the work I did, the activities I did, how busy I was, it definitely seems like another life. And the problem with that is, the way I am now has become normalised in my mind. And so I forget that I still do things differently in order to accommodate my condition because I’m now not aware that I do them. I don’t go into town because I know it’ll make me tired and I have things to do at home. I have to plan my showers days in advance sometimes, to make sure I’m actually, y’know, clean but to make sure I have time to rest afterwards. I get tired in the afternoons. I get pain and fatigue when it rains. I take strong painkillers, I don’t clean my own house, and just today I vetoed a trip to the supermarket at the end of the road because I felt in too much pain (even though I would’ve driven there rather than walked). But that’s now my “normal”. I do all these things without thinking about it because it’s habit. Which worries me that I might miss them when I’m talking to the ATOS person. Last time I said it felt like an exam. So I guess it’s time to start revision. 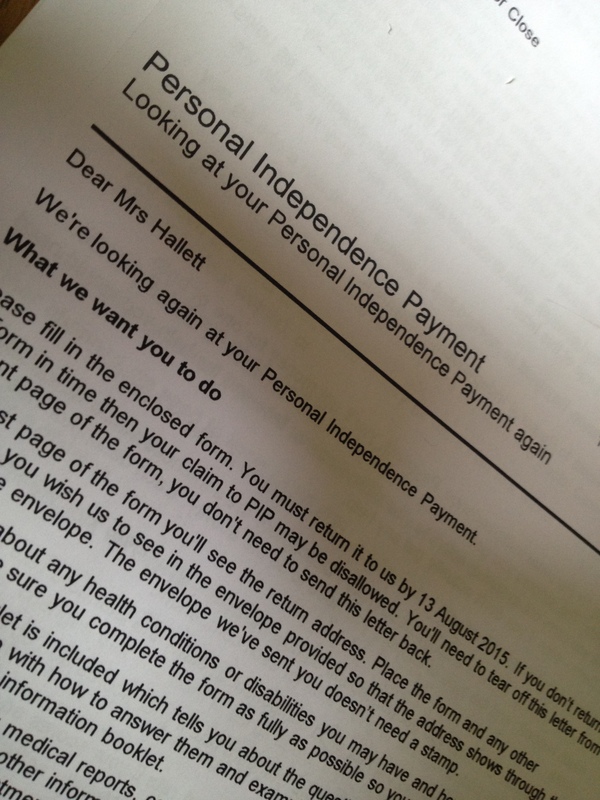 I spent more than half of 2014 blogging about the ongoing saga of my PIP application. I first applied in January and through a complicated form, a poorly-recorded assessment and nearly nine months of waiting I finally ended up getting a disibility benefit. Twelve months later and it’s time to go through it all over again. Yep. The form arrived. I have to do the whole sorry deal this year too. Yes I have the photocopies of the last form. Yes I still have the Word file with all my written answers in, and copies of my letters. Yes I know they hopefully won’t ask me in for another assessment. But still. Another few months of wondering how long it’ll take and if I’ll actually be re-awarded. I’m still exhausted from the last time. DWP assessments – a pass or fail exam. The building I went for my PIP assessment in is probably the most inaccessible building I’ve ever been in during my 32 long years on this earth. ATOS in this area will do home assessments for people with mobility issues, which is good as the entrance has three heavy doors you have to be buzzed through, the tiniest waiting room of all time and the tiniest assessment rooms. 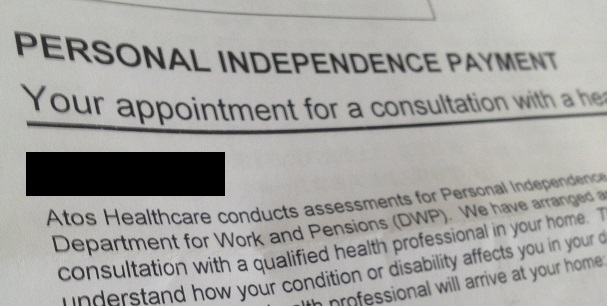 PIP assessors are a medical professional of some sort – OT, physio etc. which means the chap I saw should at least know a bit about what’s going on. He was really nice, which was good, but I felt like the assessment wasn’t thorough, and just went through everything I’d already written about in detail on my form. He asked about what conditions I had, the medications and their side effects. He was supposed to ask about a “typical day” but in fact he only covered eating and drinking and didn’t ask any more. The quote of the day was: “I need to write down an explanation of what this condition is because the person reading it won’t know about it”. Confidence boost right there! Then there was a “physical” which was composed of your usual basic physical tests – touch your toes, squeeze my fingers, push against my hands and so on. If I’d have applied with a mental health condition I’d be quite confused by this point. I did take someone along with me – my mum – who took notes (she didn’t ask if she could but she wasn’t stopped). The ideal person for me to take should’ve been my husband but a) see above re. wheelchair accessibility and b) it would be a foolish idea for me to walk into my PIP assessment with someone who is more disabled than I am. It was exhausting. Towards the end I just couldn’t get all my words out. I missed so much. I feel like the right questions weren’t asked. I feel like I wasn’t enabled by the assessor to make sure I explained everything. It felt like an exam. It felt like I should revise, make sure I can remember everything, make sure I answer the questions with the right answers. I felt like I was being tested, and I would come out with a pass or fail. Because the system is set up to make us fail. It’s set up so that we feel like we’re having to say and do the “right” things to be able to pass the PIP exam. We have to prove our disabilities, our illnesses. And rather than a system designed to make sure people receive the support and help they need, rather then a system that will hold your hand and guide you through with your best interests at heart, it is designed to put you on trial. To say “prove it”. And even when you do, it doesn’t always believe you. I’m currently working on the assumption that I’m going to have to appeal. I figure that way, if I am successful first time it’ll be a nice surprise, but I’m being realistic. But this phase is done. Now I wait for the brown envelope with the PIP exam results in. It’s that time again…my six month PIP-iversary! And what did I get as a kind gift? An ATOS assessment. On Monday morning. To explain: I called the lovely DWP this morning as my application has now passed the golden 26 week mark and I was finally allowed to talk about it to another person! “Not especially” I thought. “Yes” I said. 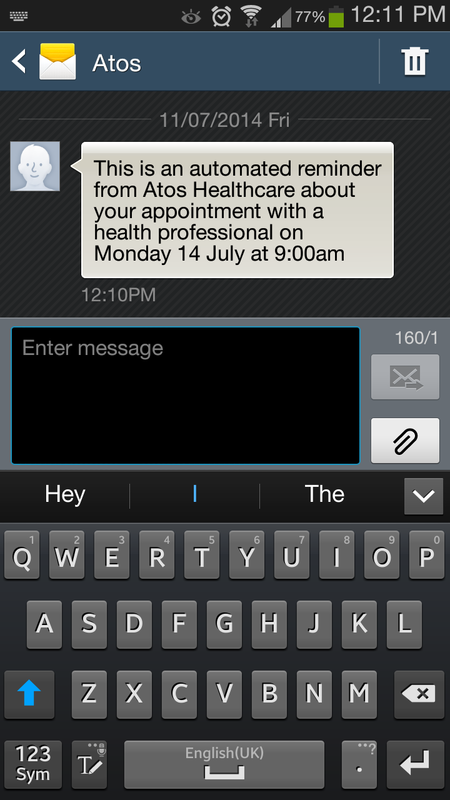 She gave me a phone number, so I called ATOS. 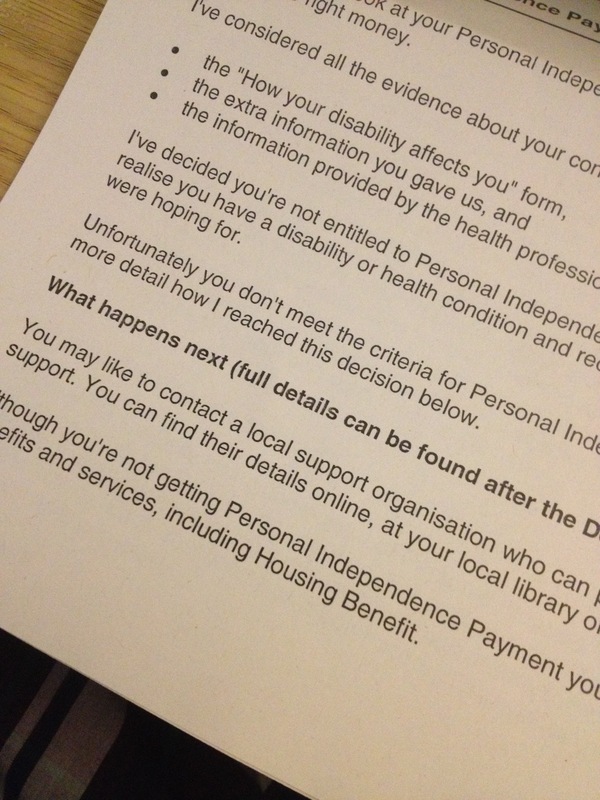 So, now I have my ATOS assessment for my PIP application. Have roped my mum along into being my transport plus an “advocate” while I’m in the appointment – I need someone else to remember stuff for me. Ideally I’d take my husband but in this instance he would not be a good person to take. Why? Because he uses a wheelchair, and I can’t turn up to my PIP assessment with someone who is more disabled than I am. ATOS are famed for making ridiculous assumptions, and seeing me as the “less worse off” one would not count in my favour. So, no husband on this one. So that’s the situation. Seems to have gone from standstill to full throttle in the space of no time at all. I have, at least, got the very good guidance notes from Benefits and Work so I will study them this weekend, and revise for my assessment.